CVLT Nation presents an interview between Ryan McKenney of TRAP THEM and Rick and Joe of THEORIES. 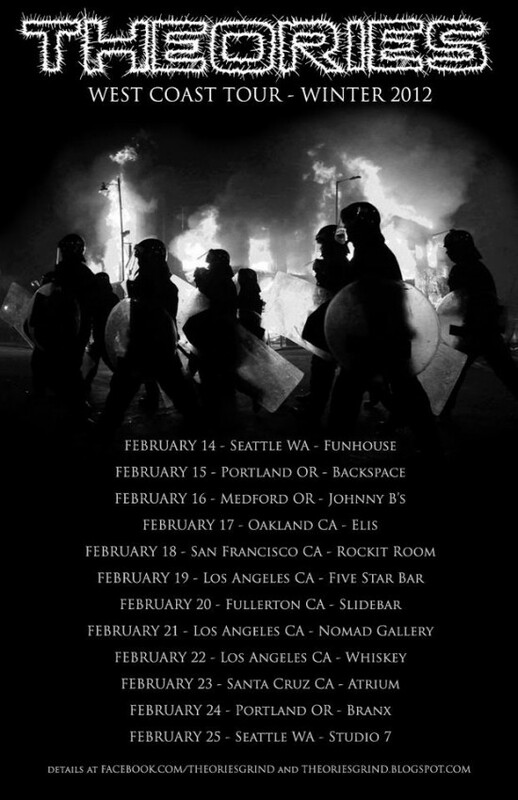 Seattle-based terminators Theories will bludgeon the West Coast with twelve live assaults beginning with a hometown gig this Tuesday. The tour runs down the coast over the next two weeks and will see Theories laying down their grind/crust-influenced death metal alongside Vektor, Transient, Lack of Interest, Xibalba, ACxDC, Impaled, Brainoil, Battlemaster, Infernal Stronghold, Murder Construct, Touché Amore, Goatwhore, Hate Eternal, Fallujah, Cerebral Bore and tons more along the way. The reign of Theories is just beginning, but is off to a raging start. With solid regional performances featuring both local and national acts, as well as a West Coast tour already under their belt since inception last year, the band are proving themselves to be a hard-working unit who are utilizing the skills they learned growing up in a DIY scene and in promoting the other acts the members of Theories are associated with, including Skarp, Book of Black Earth, Samothrace, Scourge Schematic, Splatterhouse, Iamthethorn and other previous acts. Having just recently signed with booking kingpins The Pantheon Agency, the band are devoted to hitting the road as much as possible through the new year. PUBLISHED on February 12, 2012. UPDATED on February 14 – THEORIES tour dates added. THE DILLINGER ESCAPE PLAN interviewed by Dead Press!